If you wander up the Hohen Markt street in Vienna’s centre at the top of the hour, expect to see a crowd of people peering up expectantly at an insurance building. The object of their fascination: a clock called the Ankeruhr. The Ankeruhr is another creation that falls into that turbulent period of Austrian history when modernism, imperial tradition, and the chaos of war all collided. It’s a beautiful Art Nouveau clock that forms a bridge between two buildings. The clock was built in 1914 by the Anker Insurance Company (now Helvetia) as part of the expansion of their headquarters, the work intended as both an artistic contribution to the city’s culture and a subliminal reminder of the importance of life insurance. The painter and sculptor, Franz Matsch, designed the clock at the height of his fame (he was once a close associate of Gustav Klimt). But people don’t collect there just to admire the architecture. A set of 12 figures rotate slowly around the minute display twice a day, so a new one appears each hour. The clock also marks the top of the hour with organ music, each piece matching the figure associated with that hour. Who are the Ankeruhr figures? 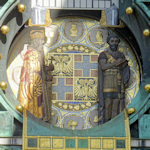 A plaque next to the clock reveals the identities of these 12 figures, who represent a journey through Austrian history. The clock is very close to the central square dominated by the cathedral.